When it came to making dinner on Tuesday night, I looked in the fridge to see what ingredients I had on hand. There on the bottom shelf I spotted a nice, ripe pineapple. I knew I had to make one of my Chinese favourites: sweet and sour pork. So I got to work. Traditionally, the recipe calls for tinned pineapple and tomato paste, but the key to this modern version of the Cantonese classic is fresh ingredients. Fresh = more flavoursome and your tastebuds will thank you for it. Fresh pineapple, which is starting to come into season and fresh tomatoes as a base for the sweet and sour sauce. I also added cucumber for colour and because it’s so mouthwatering. The pork itself is twice cooked – it can be deep fried both times, but for a more wholesome version I chose to do the second cooking in the oven. The batter is light and crispy, and while it helps soak up the tangy, sticky sauce it doesn’t overpower the sweet flavour of the pork. While it tastes great on the day, it is even better left in the fridge overnight as the flavours have the time to develop – perfect for a lunchbox! Preheat oven to 180C (160C fan forced, 325F, Gas Mark 4). Place sliced pork in a large bowl. Add soy sauce and egg yolk. Mix well. Sift in both flours and mix well to coat the pork. Heat oil in a small saucepan until hot – test by dipping a slice of pork in it, if it starts bubbling vigorously, the oil is ready. Reduce heat to 3/4 capacity. Fry pork in batches for about 2 minutes. Remove using tongs or a slotted spoon and drain on kitchen towel. Place in a single layer in a baking dish and bake on the top rack in the oven for 15 minutes. Dice cucumber on the diagonal and pineapple into bite sized pieces. Heat a little oil on high in a wok and add pineapple. Allow to caramelise and char slightly. Add cucumber, chilli and half the garlic. Stir fry for 2 minutes. Place in a bowl and set aside. Place diced tomatoes, garlic, sugar, vinegar and water in the wok. Bring to the boil and reduce heat. Blend cornflour with extra water and pour into the sauce. Stir and allow for the sauce to thicken slightly. 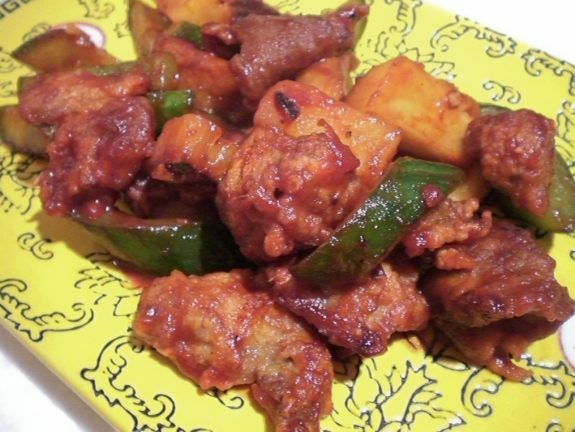 When ready, add the pork, pineapple and cucumbers into the sauce and serve with steamed rice. Comment on this post or share it via Email, Facebook, Twitter and more using buttons above the comment box. I love Sweet and Sour Pork! I like the fact that you opted for fresh ingredients. The photo looks so yummy! The only thing missing now is a big bowl of fried rice! Coolness! Thanks Marvs 🙂 I’m still trying to master the art of fried rice, so until I find that perfect recipe I’m serving with steamed… PS Any tips I should be aware of?